Habitat: Broad-leaved Dock is native to Europe. It prefers soils with high nitrogen content. 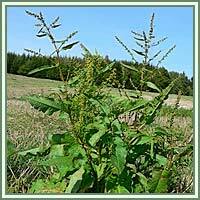 Description: Broad-leaved Dock is a perennial, aromatic weed. It has broad, obtuse and large leaves, bitter rootstalk and green stalk with red streaks. Stems have nodes covered by a thin membrane, characteristic of the plants of Polygonaceae family. Near the bottom of the stem, leaves are usually larger and rounded to heart-shaped. Leaves situated on the higher branches are smaller. Flowers are borne in large clusters. They are green in color, and they change to red as they mature. The plant is in bloom from June to September. Seeds are reddish-brown. Medicinal use: Dock leaves are known to have astringent properties. Applied externally, the leaves are used in treatment blisters, burns and scalds. Root is considered to be both astringent and a “blood purifier” or detoxifier. Tea made from the root can be helpful in treatment of jaundice, boils and coughs. An infusion made from the root can be beneficial in treatment of skin eruptions. 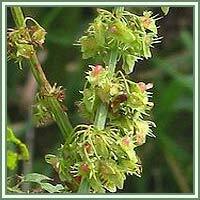 It is said that a tincture made from the plant could relieve menopausal symptoms.